From time to time, Food and Fuel America.com highlights the leading 2008 US Presidential candidates' positions on renewable energy. Sometimes it's easy to find, other times it is not. Requiring New Vehicles Be Flex-Fuel Vehicles: Joe Biden would require all cars marketed in the US be capable of running on E85/flex fuel or regular gasoline by 2017 - a cost estimated to be just $100 per car. 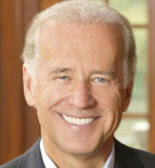 Joe Biden would direct automakers to gradually increase flex-fuel vehicle (FFV) production, increasing ten percentage-point increments annually, until nearly all vehicles sold in the U.S. are flex fuel vehicles within 10 years. At this rate half of all vehicles sold in the US would be flex fuel vehicles in five years. Currently, flex-fuel vehicles -- those able to use both regular gasoline and blends of up to 85 percent ethanol (E85) – make up only about two percent of vehicles on the road today (5 million). Requiring Large Gas Station Chains To Sell Alternative Fuels: Only around 1,300 of the 140,000 gas stations nationwide offer E85 or alternative fuels to customers. Major oil companies (those that own 4,500 stations or more) should offer alternative refueling capability at 50 percent of the stations they own by 2017. Joe Biden would require large chains to install E85 pumps at their stations, increasing by five percent annually over the next 10 years. Increasing The Amount of Farm-Grown Fuel In Our Fuel Supply: Joe Biden would increase the amount of ethanol and biodiesel included in the nation's fuel supply by extending and increasing the current Renewable Fuel Standard and setting standards for biodiesel. Currently the Renewable Fuel Standard sets a benchmark of 7.5 billion gallons by 2012 – a fraction of the overall U.S. gasoline consumption which is 140 billion gallons per year. Joe Biden would increase the benchmarks to: 10 billion gallons by 2010; 30 billion gallons by 2020; 60 billion gallons by 2030. As always, FoodandFuelAmerica.com does not support or endorse any candidate for any election. We will; however, continue to highlight important energy policy positions of the major candidates.